At our last training seminar, several customers accepted our invitation to share their experiences with Maintenance Connection, highlighting how the software has impacted their organization. At Checkpoint 2011 in April, we will again be looking for customers that would like to tell “their story” and promote what their organization has done with MC. Are you interested in promoting what you have done with the software and telling your story? We’d love to tell people about it, so email checkpoint@maintenanceconnection.com today and schedule your video spot. Earlier this year we introduced you to the McGraw Hill company who is one of our successful customers. The feedback they provided was directly from a survey project called “Profiles of Success”. We have selected Towson University to be showcased in this blog post; another customer who has completed the below survey. If your organization is interested in participating in the Profiles of Success survey, simply fill out this form and we’ll include your response in a future post. Have you signed up for our Western Regional Training Seminar? The early bird special will expire by the end of this month causing prices to increase a minimum of $100/person. Please click on the image below to download a PDF with additional information. A special thanks to Troy Lingelbach from Towson University for all of his hard work throughout his implementation and being gracious enough to provide such thorough feedback about his usage of Maintenance Connection. I have had the pleasure of personally working with Troy on his roll-out of Maintenance Connection and should mention his continued patience and dedication is one of the main fators they have seen such outstanding results. What were some of the main business drivers for implementing CMMS? Prior to Maintenance Connection we operated 2 independent CMMS’s simultaneously. The reason for running two systems was because each system served several different needs. One system (Maximo) served the Academic buildings on campus. The other system (which was web based), was designed and developed in-house, and served the Residential buildings on campus. Our main business driver for choosing Maintenance Connection’s CMMS was because we needed a single web based system that could serve our entire campus. With the Academic and Residential buildings having different requirements, this system needed to be flexible yet fully capable of providing a complete CMMS. Because of all these needs, we chose Maintenance Connection since their CMMS provided the best possible options and would produce the best end results. Our top reason for selecting Maintenance Connection was because they could easily customize their CMMS to our organization and make it fit within the processes we already had in place. After implementing it, we noticed the benefits of having a 100% we based CMMS software, and appreciated the fact that the system was extremely easy to use. We have two primary uses for our CMMS, which have provided strong benefits and continuous results. Our Physical Plant staff uses Maintenance Connection for preventative and corrective maintenance. Our Faculty, Staff, and Resident Students, on the other hand, access Maintenance Connection’s Service Requester to initiate a request for repairs. This has helped out tremendously as all requests are automatically routed to the appropriate shop according to the respected problem type (a very efficient process). List a few improvements that your company has experienced as a result of implementing Maintenance Connection’s CMMS? Improved communications and relations with our customers. An approx. 75% reduction in telephone calls to our Work Control Center. This has drastically helped save labor cost and allowed our employees to become more productive. We have also noticed improvement within our record keeping and reporting abilities. We have eliminated numerous bottlenecks in the work order flow process. And most importantly, we have benefited from a drastic improvement in productivity from our maintenance staff by maximizing their ability to improve areas around our campus. Overall, our implementation went very well without any major issues. Our account manager and the entire Maintenance Connection support team have always been available when we needed them. Our system has been up and running for 2+ years without any unscheduled down times. Implementing a CMMS in your organization may require substantial changes to the way you operate. (When in reality, it should be the other way around – the CMM system should customize to the organization’s needs. This is why we chose this company for our CMMS needs). Choosing Maintenance Connection has taken our organization to the next level, without causing unnecessary strains or burdens to our operations. Maintenance Connection’s CMMS integrated very well with the way we work and has provided many additional benefits that we never had before. With all the wonderful feedback we’ve received from each of our customers, we decided to highlight these through a new tool called “Profiles of Success”. Through The MC Blog, we will periodically select a customer who has completed the below survey. If your organization is interested in participating in the Profiles of Success survey, simply fill out this form and we’ll include your response in a future post. A special thanks to Mark Samons and Zack Hess at The McGraw-Hill Companies for providing such thorough feedback about your usage of Maintenance Connection. We used the MP2 system by DataStream prior to implementing Maintenance Connection. And which other CMMS options did you consider (Optional Question)? (because if the staff can’t use it – it’s useless). Ability to manage multiple locations and stockrooms. Excellent ability to produce custom reports without programming. Because if we can’t get the data we need back out of a database, why even put it in? Ability to submit work orders online through the requester tool. And of course, their e-mail notifications detailing work order history. This was a fantastic tool and ensured our processes were running smoothly. We were considering DataStream’s 7i, but Maintenance Connection’s price and overall value surpassed that option. The ability to manage equipment assets and their care (PM) across an entire organization. We can now do this with great consistency between locations. Since implementing this program, out-of-stocks have become nearly non-existent. We can now monitor partial receipts until a stock order is complete. The ability to monitor inventory usage over time has allowed us to adjust stock levels to the needed quantities. Technicians are now able to quickly narrow down searches in equipment history to find past issues with a particular piece of equipment. They have also had great success finding similar failures across multiple locations, which has helped speed up the process of troubleshooting. Downtime is definitely reduced, and overtime can often be reduced or completely avoided. We have enjoyed having the ability to monitor our performance in order to see what we do well and where we need to improve. In turn, this has allowed us to provide the best possible service to our customers. The initial purchase was painless for us. We continuously asked Brad, at Maintenance Connection, countless questions and for repeated online demonstrations during our decision making process to ensure we were getting the best product possible. In the end, Brad was extremely helpful, he did not pressure us, and definitely let the product do the talking. We decided to have Maintenance Connection host our database initially, until we could secure space on our in-house servers. This proved to be a good idea, as it made it easy to work the Maintenance Connection Support Team during set-up. Their help made the process of becoming familiar with the CMS software very easy for us. Overall, the training we received from Maintenance Connection’s Support Team helped a lot and our “go-live” experience was very successful. Map out a plan for documentation and data integrity and ENFORCE it. If work orders are not filled out, or are filled out poorly (i.e. – attached to wrong asset, not including parts used, lack of detail in labor reports) you will be disappointed with the results. We tie this to our yearly goals, and rate our techs on it. It is a good way to keep employees accountable. If you have old data to import – and it is not up to par – consider starting fresh. You will quickly build history that is complete and useable. Don’t try to do it alone. You know your business, the people who created the CMMS know their software. Work together for the best results. Pivot reports are an extremely useful way to compare data. Pivot reports require you define which fields should be the Row, Column or Summary Data. Below is an example of a pivot report that shows a list of Problem Names and then a count of work orders for each by month. 1) Add 3 “Available” fields: [WO] Problem Name, [WO] Requested, [WO] WO # to a Closed Work Order List report found in the Work Order (Closed) reports folder. Be sure to copy and rename this report so that the base report is not modified. 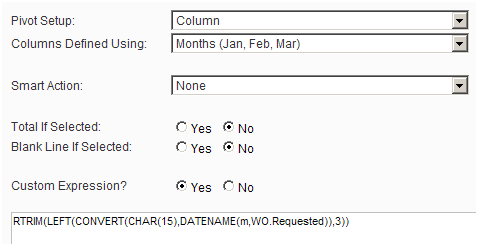 3) On Layout tab, select the Summary Report radio button. In addition, check the Display Column Lines checkbox. 4) After Applying the Available fields, click each and select Edit. Upon completion of the above setup configuration steps, the report may now be ran and you should receive the same layout as seen in the first screenshot above. Pivot reports may be configured with a variety of field combinations to achieve different results. For example, a You may also add additional sorting groups or columns to enhance the report analytics, conditional formatting to highlight certain data elements, or charts/graphs to summarize the information. In version 4.0, the Reporter Guide will be available as a PDF and HTML (similar to current User Guide) which will include more user friendly navigation tools, such as, Search and Index. Additionally, a new “Help” icon will be present in the top right of the Reporter dialog box for in-line assistance. We expect that many customers define the success of our application by the reports they can create. Our support team is always available to help you meet your reporting goals. Please contact us at (888) 567-3434 x88 and/or support@maintenanceconnection.com. We are excited about the success that so many of our customers have experienced by implementing Maintenance Connection and are currently working on our 2009 Customer Profiles of Success project to learn more about each customer’s unique story. We have selected several companies to participate and have received some outstanding responses that we will be highlighting in future blogs. By filling out the simple seven question form found at the link below, you can become a part of this inspiring project. We will be compiling these case studies to be published at the www.maintenanceconnection.com website under the Customers area.